Imagery analysis of North Korea's latest missile launch reveals a bigger, better rocket that's been domestically built. The US remains determined to stop North Korea from building a credible nuclear force, but it's looking like the only option left is military intervention. The US ambassador to the UN said the launch brings the US closer to war, but experts say the US might just have to accept North Korea as a nuclear state. The results are in from North Korea's latest missile test, and it looks more official than ever that the rogue nation has joined the elite group of nuclear nations despite the US's best efforts. A trove of photos released by North Korean media show the launch process as supervised by Kim Jong Un and reveal an entirely new missile, the Hwasong 15, which is unlike anything ever seen from the nation. "This is a very big missile," Michael Duitsman, a researcher at the James Martin Center for Nonproliferation Studies tweeted. "And I don't mean 'Big for North Korea.' Only a few countries can produce missiles of this size, and North Korea just joined the club." North Korea has tested intercontinental ballistic missiles before, but researchers found them prohibitively small for delivering a heavy nuclear device halfway around the world to the US. Tal Inbar, the head of the space research center at the Fisher Institute for Air & Space Strategic Studies noted on Twitter that the reentry vehicle, or the tip of the missile that must return down to earth, is "HUGE." But Mike Elleman, a leading missile expert, wrote on 38 North that despite the missile's size, it still probably can't send a heavy nuclear warhead as far as the US's east coast. According to Elleman, when North Korea demonstrated the 8,000-mile range of the Hwasong-15 and its other long-range missiles, they "likely carried very small payloads." Elleman estimates that with a reasonably sized nuclear warhead onboard, the missiles would struggle to reach the US's west coast. 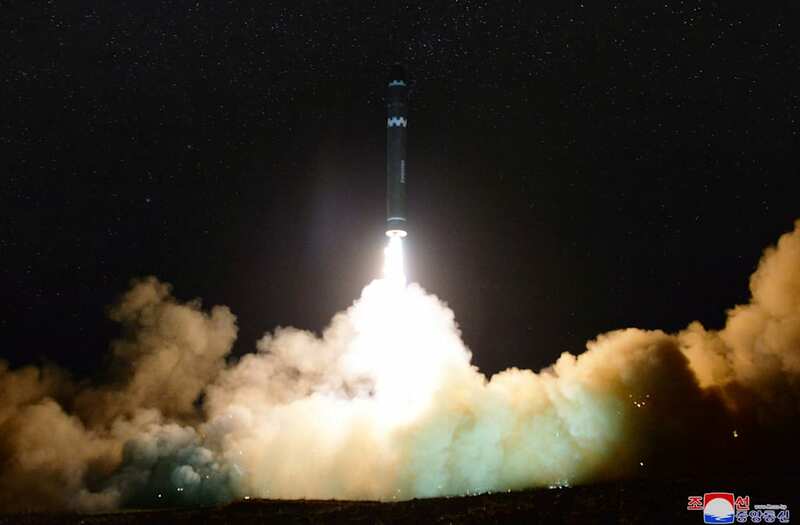 In comparison to the other ICBM launches from North Korea, the response from President Donald Trump has been muted, and perhaps for good reason. Though Trump has "been reasonably effective" in isolating North Korea and rallying support for sanctions internationally, his efforts have ultimately failed, Paul Bracken, a professor of political science at Yale, told Business Insider. But North Korea just showed a domestically made missile and missile launcher. It showed a capacity to improve upon its existing designs, and to design new missiles independently. In short, it showed that even with "maximum pressure" from Trump, aircraft carriers nearby, and US jets buzzing around, it can build a credible nuclear weapon, and will do so in the near future. "We know they were building to this. They got it no matter how badly we wanted to stop them. Our options to stop them are still awful," Robert Kelly, an associate political science professor at Pusan National University in South Korea told the Los Angeles Times. "We are stuck. We have to adapt to North Korea as a nuclear power, and we will actually." The US has repeatedly said it will not accept North Korea as a nuclear power, and that it will consider military intervention to stop it. As the US's Ambassador to the UN, Nikki Haley said, the launch "brings us closer to war," even though the US is not seeking war with North Korea. While Haley remarked that the "North Korean regime will be utterly destroyed" in such a war, she neglected to mention that South Korea, and possibly the US, could also face utter destruction from a North Korean nuclear attack.